The business model of WWC’s Mai N’dombe REDD project is to sell carbon credits. It generates these credits by producing reports showing how the project’s activities prevented deforestation. Those reports are then verified by auditing firms, paid for by the REDD project (see 10 Things Communities Should Know About REDD, available also in Lingala and Swahili). In 2011, ERA claimed that the “Improved Forest Management portion of the project will result in the cessation of active commercial logging activity”. (2) In December 2012, the auditing firm Det Norske Veritas (DNV) accepted the claim that without ERA’s intervention, re-issuance of two logging concessions cancelled in 2008 would have been imminent. But – in 2011, the DRC government’s moratorium on issuing new logging licenses, which dates back to 2004, was still in place. This raises questions over ERA´s claim that its intervention prevented imminent issuance of new logging licenses for the project area. WWC mentions correspondence with ministers as evidence that the two logging concessions which were turned into a forest conservation concession for the REDD+ project would have been re-issued. However, no new logging concessions have been issued anywhere in the country since 2011, and doing so would have breached a Presidential Decree. The majority of the carbon credits are thus based on the claim that a re-issuance of logging concession and commercial logging activities were imminent in 2011. Project calculations set emissions prevented by the Mai N’dombe REDD project at 1.5 to 3.0 million tonnes of CO2 per year over the 30-year period of the project (for comparison, Denmark’s annual emissions from international aviation were 2.5 million tonnes in 2013). Another questionable assumption. A December 2015 draft of the DRC government’s so-called “Emission Reduction Programme Document” to the World Bank Forest Carbon Partnership Facility confirms that of 11 industrial logging concessions in the Mai N’dombe province, only two are currently operational. Furthermore, official government figures show no recorded timber production at all between 2002 and 2006 for the two logging concessions that now make up the WWC forest conservation concession. Irrespective of this context, DNV verified conformity with the Verified Carbon Standard (VCS) and the Climate, Community and Biodiversity Alliance (CCBA) standard. DNV also confirmed that between March 2011 and October 2012, the Mai N’dombe REDD project had prevented the release of 2,548,715 tonnes CO2– carbon credits that could now be sold with the CCBA and VCS seals of approval. Since 2015, the Mai N’dombe REDD project has also been offering carbon credits directly to individuals, through “Stand for Trees”, an initiative supported by US developmental agency USAID. The initiative aims to increase sales of forest carbon credits after corporate purchases have not been developing as expected. In December 2015, the project also tried to raise funds through an online donation platform, receiving US$ 4,720 of the US$ 50,000 hoped for. (6) It appears that carbon credits currently on sale from the Mai N’dombe REDD project are still part of the credits issued following the December 2012 verification audit by DNV. Benefits for local communities are a cornerstone of the Mai N’dombe REDD project’s marketing material. “The local forest community of 50,000 Congolese villagers receive direct benefits from the project”, reads the first sentence of the “Project Impacts” description on the Wildlife Works website. (7) Six out of 11 slides that make up the project presentation highlight community benefits, and the joint ERA and WWC press release announcing successful VCS and CCBA certification in 2012 states that “local communities will receive direct benefits from the project in the form of jobs, schools, health clinics, improved food security through better agronomy and redevelopment of robust native fish stocks, capacity building of local NGOs and Community Based Organizations (CBOs), all financed through a transparent and equitable sharing of the carbon revenues.” (8) At the same time, documents prepared for auditing firms describe forest use by local communities as the biggest remaining threat to the forest. In 2011, ERA wrote that the “reduction of illegal logging and the reduction of unsustainable forest clearing for agriculture and fuel wood will be addressed in the REDD+ portion of the project.” (9) Analysis of tree cover data for the area using Global Forest Watch suggests that deforestation in the REDD project actually soared in 2011. Whether this was as a result of people quickly clearing land for food production in anticipation and fear of imminent restrictions or due to illegal logging within the conservation concession, is not known. Many REDD+ projects first put forest use restrictions in place before alternative options for peasants relying on the forest to grow the food that feeds their families are operational at village level. Information gathered during a visit in 2014 by the World Rainforest Movement (WRM) to the Mai N’dombe area suggests that the same is true for the Mai N’dombe REDD project.In November 2014, WRM visited the area on invitation of the national peasant organisation Confédération paysanne du Congo, COPACO-PRP, a member of La Via Campesina. The joint activities in the region took WRM and COPACO-PRP through villages along a road that cuts through the middle of the REDD+ project concession. However, it was not possible to interview people in some villages along the road because of a combination of high tensions between communities in this portion of the conservation concession and the REDD+ project and hostility from project staff and supporters towards WRM before, during and after a workshop on climate change and REDD+, held in the city of Inongo (where the Wildlife Works project office is also located). But conversations in Inongo and the town of Nioki, south of the REDD conservation concession, suggest that the benefits highlighted in promotional material about the Mai N’dombe REDD project may not be quite so apparent to all in the communities. It seems very likely that opposition to the project remains strong in many villages, especially in the western, inland portion of the concession. Coincidentally, in one of its audit reports, DNV note that they did not visit this portion of the conservation concession during their certification assessment, citing time constraints. There is no indication that DNV sought information from local organisations about the perception of the REDD project in the part of the concession area not visited during their field audit. Many workshops have been held and papers written on the issue of ‘Free, Prior and Informed Consent’ (FPIC) in relation to REDD+. Most of them miss the point, however. They skip over the question of whether REDD+ as a mechanism that sells carbon credits justifying destruction elsewhere could ever be considered to have the Free, Prior and Informed Consent of all of those whose way of life is significantly affected by the project activity: people faced with continued destruction of the territories they depend on as a result of a company buying a carbon credit from a REDD+ project elsewhere are never asked whether they consent to the carbon offset, for example. Neither ERA nor WWC bought the land that generates their REDD carbon credits. Rather, ERA convinced the DRC government to issue a forest conservation concession for the land that had previously been part of two industrial logging concessions. These logging concessions had been cancelled, like most other industrial logging concessions in DRC, as part of an Interministerial Commission process in 2008 which was set up by the World Bank to rule on the legality, or otherwise, of the country’s 150 or so industrial logging operations. (10) As a concession-based initiative, the Mai N’dombe REDD project demonstrates another problem with the FPIC debate in REDD+: the common gap between how FPIC is applied in REDD+ initiatives, and how application of FPIC is communicated in REDD+ marketing material. To our knowledge, communities in the REDD project area were not involved in the negotiations over issuance of the forest conservation concession to ERA, now held by WWC. There is also no indication of ERA having consulted communities in the area prior to seeking negotiations with the government to canvass community views on their proposal. Only after the Carbon Rights Agreement and the Forest Conservation Concession contracts were signed between ERA and the government of DRC in March and August 2011, respectively, and after having announced that they will seek certification to the CCBA standard, does ERA seem to have entered into contact with communities. When ERA arrived in communities, the big decision – allocation of a forest conservation concession that would restrict forest use which provides the livelihood for a large part of the local population – had already been made. Thus, no consent seems to have been sought from communities over this decision that provides the basis for the REDD project. That fact, however, is not stated clearly in public relations material highlighting social benefits and the involvement of communities in project activities. Such questions appear all the more relevant considering that much of the land in the region is known to be under local communities’ customary tenure. Communities may therefore not recognize the boundaries of a concession if it overlaps their customary land. UK-based NGO Forest Peoples Programme estimate that at least one third to one half of the WWC conservation concession overlaps local communities’ customary territories. The ‘Mapping For Rights’ initiative by the Rainforest Foundation UK has even documented the extent of customary tenure in areas bordering and overlapping the western edge of the WWC Mai N’dombe REDD project. (13) And there is indication of conflict over agreements having been signed with the REDD project, seemingly without full consent from the villages that customary chiefs (claim to) represent. In ‘Redeeming REDD’, Michael Brown notes that “In October 2012, reports of conflict in the Basengele sector of the conservation concession area circulated through email traffic […]. The customary chief in Bongo was apparently shot at, and his house reportedly burned for having been perceived as signing away customary lands to foreigners without full community consent.” (14) The incident was also mentioned in conversations WRM staff held while visiting the area in November 2014. People explained that the person had been one of three customary chiefs (“chefs de groupement“) who had signed agreements with the REDD project, and that the agreements signed with those three customary chiefs at the clan level (chef de groupement), rather than village level (chef de terre), were cited by the REDD project as proof of community consent. The incident cited above took place in the part of the conservation concession, which WRM’s 2014 visit found to be hostile. A September 2015 presentation on possible benefit sharing models should the DRC government’s proposal for a ‘jurisdictional REDD’ pilot project under the World Bank Forest Carbon Partnership Facility be accepted, notes that communities, in the Basengele area, continue to oppose the REDD+ project. The DNV audit reports for CCBA certification do not mention any of this information, even though the CCB standard contains a rather long definition of FPIC. And, DNV decided that the Mai N’dombe REDD project complies with the requirements. The CCB standard defines “Prior” as “sufficiently in advance of any authorization or commencement of activities”. Did communities have “the option of withholding consent” over the principal decision that authorizes the REDD project (issuance of the conservation concession)? If that option was not provided, with the justification that no such procedure is foreseen in DRC law, for example – should this not be communicated clearly, explaining what decisions community consent was sought on and for which decisions no consent was sought? The CCBA definition of “Informed” includes among others that communities whose consent is sought must be provided with “a preliminary assessment of the likely economic, social, cultural and environmental impact, including potential risks and fair and equitable benefit sharing in a context that respects the precautionary principle”. One would assume that such information includes legal documents and contracts, especially if a Prime Ministerial decree (of May 2011) already requires such information to be made public. This would include, for example, the legal documents establishing ERA’s (and now WWC’s) Mai Ndombe forest conservation concession. Individuals and representatives from state authorities whom WRM staff spoke to during the November 2014 visit were not aware of these documents. They also noted that the ‘Cahier de Charge’, the document that is part of the legal arrangements and outlines the obligations a concession holder has towards communities within the concession area, was available ‘in theory’ but not in practise. An extensive online search following the 2014 field visit provided no indication that these legal and regulatory documents are in the public domain or that they are accessible to communities in the REDD project area. One more REDD+ project long on promises and short on delivering on them? In conversation, people also questioned the economic viability of proposed activities. People reported difficulties that had arisen in earlier trials at growing beans, and that soils suitable for growing beans were found only in a small portion of the conservation concession. Asked about their view on the proposal to transport beans and onions to markets in Kinshasa, particularly given the state of infrastructure (or rather, the near complete absence thereof), the response was consistently one of consternation: “Right now, we transport onions from Bas Congo to Inongo, why not work on better local markets?” “With such a long distance to transport anything to Kinshasa, and the roads as they are, how could vegetables produced by the REDD project possibly compete with beans or onions grown in Bas Congo? Access there is much easier and much closer to Kinshasa than from Mai N’dombe”, were just some of the remarks. And, of course, the project promises to generate “direct local jobs”. Just how many of them the Mai N’dombe REDD project provides, is unclear. Information in documents about the project is contradictory. Information on the “Stand for Trees” website claims that the project “directly employs over 170 local people”, while slide 11 of the project description on the WWC website states that the project provides employment for just 60 people. And of course, the numbers alone do not say anything about the working conditions; whether people are hired on short-term contracts or whether these 170 / 60 people are employed by WWC. What “Conservation Revolution in the Congo Basin Rainforest”? In one marketing initiative, the Mai N’dombe REDD project is presented as the “Conservation Revolution in the Congo Basin Rainforest”. (6) Considering the impressions gained during WRM’s November 2014 visit to the region and information gathered since, such a “revolution” is hard to make out. Rather, looked at from the vintage point of the project’s impact on community rights and justice, what we see is another REDD+ project where the stories presented in glossy brochures and talks at international trade fairs and UN conferences differ markedly from the realities in the project area. Interestingly, and in sharp contrast to most other REDD+ projects we have visited over the years, we spotted only one placard announcing the Mai N’dombe REDD project during the 7+ hour drive on the road that cuts through the REDD+ concession. Perhaps such placards are more common along the lakeshore, where the majority of community-related activities linked to the REDD project appear to be taking place? In sum, the Mai N’dombe REDD project is another strong candidate for a collection of REDD+ conflicts, contradictions and lies. (1) FERN and FPP (2014): Implement in haste, repent at leisure. A call for rethinking the World Bank’s Carbon Fund, based on an analysis of the Democratic Republic of Congo Emissions Reduction – Project Idea Note (ER-PIN). (2) DNV (2012): CCB Verification Report/ Verification Statement. ERA and WILDLIFE WORKS’ Mai Ndombe REDD Project in the Democratic Republic of Congo. Verification Period: 14 March, 2011 to 31 October, 2012. REPORT NO. 2012-9749, 6 December 2012. DNV Climate Change Services AS (DNV). (3) For more information, see WRM report REDD: A collection of conflicts, contradictions and lies, and the regular articles about conflicts associated with REDD+ projects on theREDD-Monitor website. (5) Nhantumbo, I. and Camargo, M. (2015): REDD+ for profit or for good? Natural Resource Issues, No. 30. IIED, London. (7) Wildlife Works website, Mai Ndombe REDD+ Project, DRC. (8) ERA Carbon Offsets Ltd. and Wildlife Works Carbon LLC Deliver First REDD+ Project in Democratic Republic of Congo. 19 December 2012. 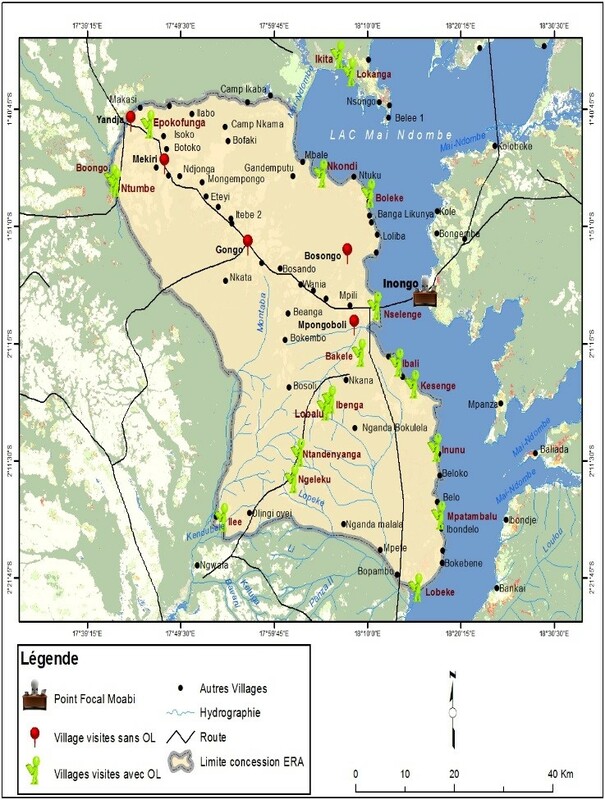 /Mai_Ndombe_REDD_Project/Mai+Ndombe+Final+CCB+PDD.pdf Accessed 05 January 2016. (12) Project documents state, that a buffer area of 2.5 km radius around villages is not included in the carbon inventories and that this area is available for food production. No information is available in these project documents on whether and how this buffer reflects the distribution of traditional use areas which are often located much further away from a village than 2.5 km, and that the October 2012 project report cited above itself notes on page 71 that “Individuals walk on average between 5 and 10 km to farming plots”. (14) Michael I. Brown (2013): Redeeming REDD: Policies, Incentives and Social Feasibility for Avoided Deforestation. Earthscan. Page 141.